It's faster to swallow a handful of pills at once than to swallow each pill individually. 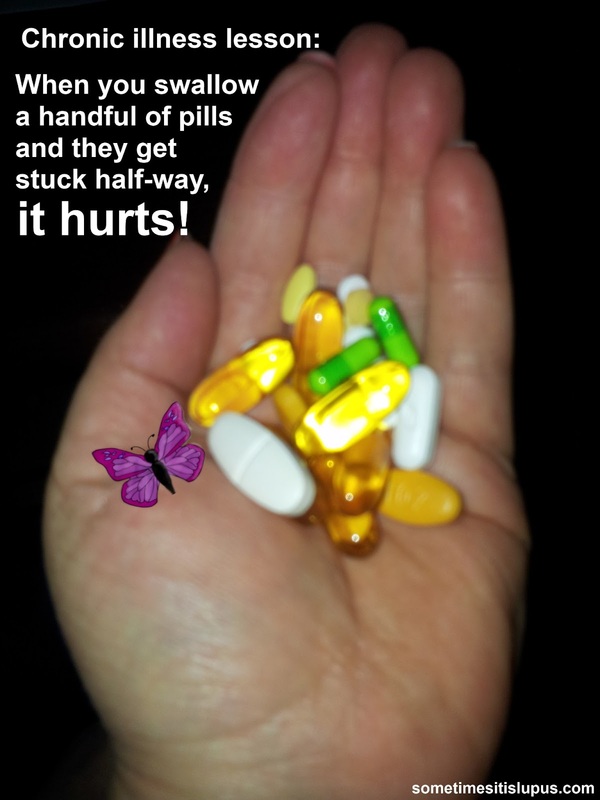 When you do (1) sometimes the pills will get stuck half-way down your oesophagus, and cause a horrible pain in your throat/chest that will not go away for hours, and nothing seems to be able to clear it. Even after experiencing (2), you will still do (1) because the amount of time you would spend taking pills individually is ridiculous. 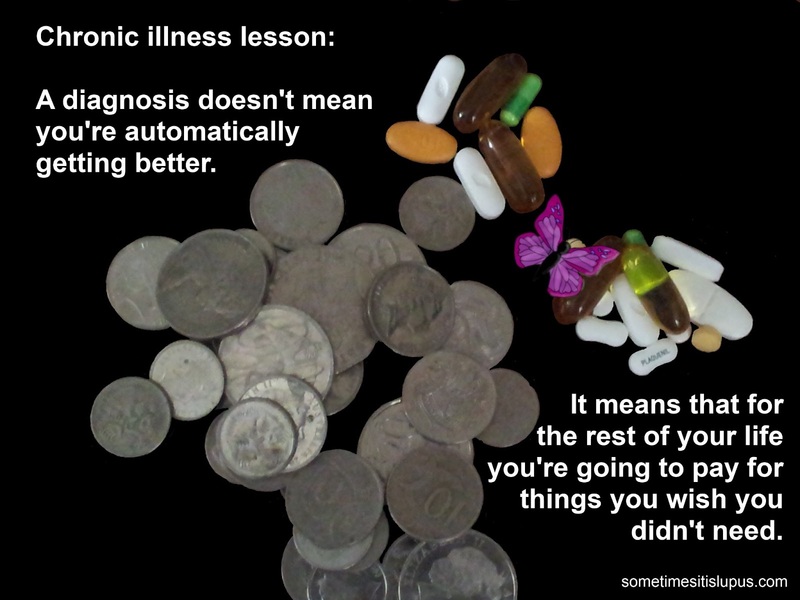 A diagnosis does not mean you're getting better. It does mean that you're going to spend the rest of your life paying money you don't want to spend on things you wish you didn't need. You are called a "patient" because you have to be patient while waiting at your GP's surgery, at your specialist's surgery, at the chemist, at pathology, at medical imaging, waiting for results, waiting for appointments.... Just learn to be patient. Because now, you're a patient. 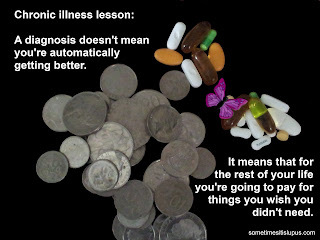 For most people a diagnosis of "lupus" is no longer a death sentence. It's a life sentence. Whatever you plan, you have to take into account the possibility that it will be a "bad" day. No matter how sick you are, someone will tell you how good you look. Sometimes, they're trying to be nice. Sometimes, they actually think you're not really sick and are making it all up. Simple tasks require long rests to recover. Complex tasks need to be broken down into smaller, simple tasks, with long rests to recover. No matter what you used to do, your body is going to rebel if you try to do the same old things. Some people will walk slower so you can keep up with them. Some will stop from time to time for you to catch up. Others will just keep going and not even realise they've left you behind. This was a very moving post Iris, thank you for taking the time to share this. I personally believe that when it comes to building awareness for chronic illnesses like lupus, then you can never share too much information. I don't have lupus, but I have written quite a bit about this autoimmune disease. I have also learned quite a bit about this mysterious illness over the last year and a half. One of the first things that I realized was that most people in the country have no clue what lupus is. This is unfortunate, because someone who starts to experience symptoms that could be indicative of this autoimmune disease could be confused for a long time before identifying the cause.